Shikhar Dhawan has been a vital cog for India in the past few years, especially in the limited overs formats where he has emerged as the first-choice opener. Dhawan’s breakout tournament in coloured clothing in fact came in England, at the 2013 Champions Trophy. Dhawan scored 363 runs in five matches at an average of 90.75 in the tournament and was one of the cornerstones of India’s win. England has always been a happy hunting ground for Dhawan and he’s scored 856 runs in 14 matches at an average of 71.33 in the country. 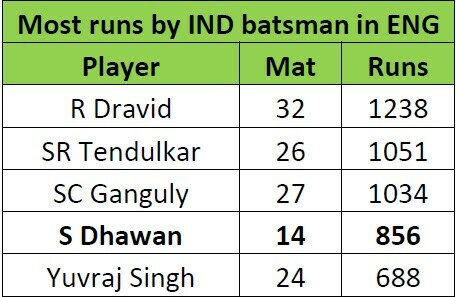 He is fourth on the list of most runs scored by an Indian in England, playing way fewer matches than the other players on the list. 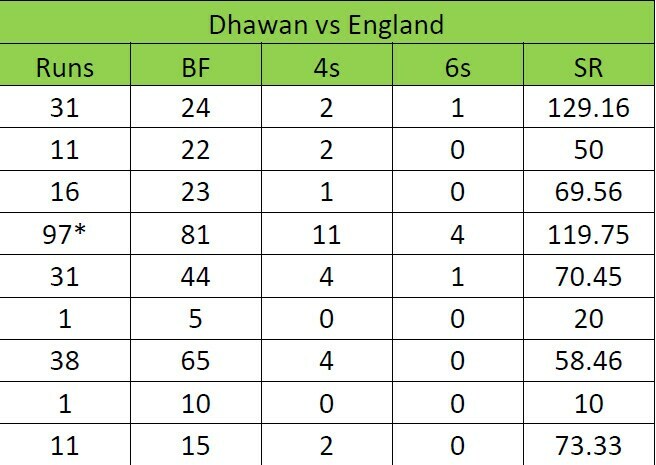 However, Dhawan’s record against England isn’t the most inspiring. In nine matches against England, Dhawan has scored 237 runs at an average of 29.62 with a best score of 97*. He has managed a half-century just once and outside of the 97, he has scored only 140 runs at an average of 17.5 in eight innings. 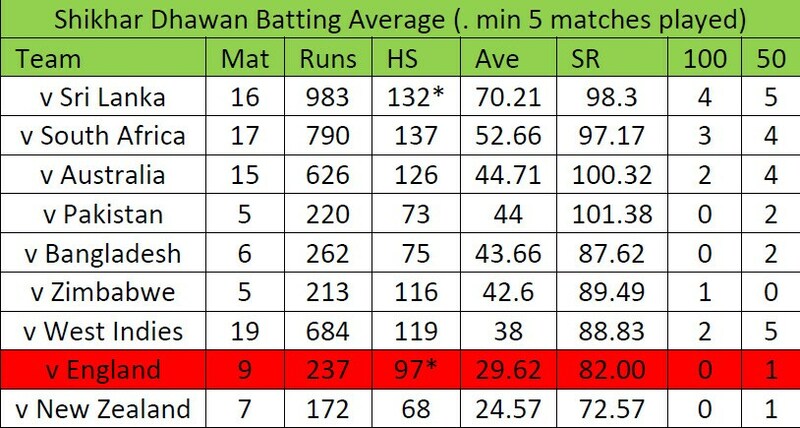 Against countries that Dhawan has featured in 5 or more matches, his batting average against England is the second worst. He will have a chance to improve that in Nottingham on Friday. Though he hasn’t had the best of starts to the tour so far, with scores of 5,10 and 4 in the T20Is, but there are some pleasant memories for Dhawan to fall back on in the country.